This Easy Turkey Chili is a comforting “stick-to-your-ribs” kind of meal. 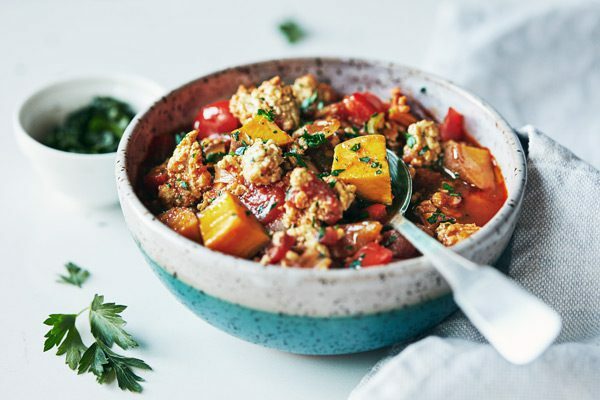 Extra lean ground turkey packs in the protein and bite-sized chunks of sweet potatoes are a delicious, fiber-filled twist on the usual bean chili. 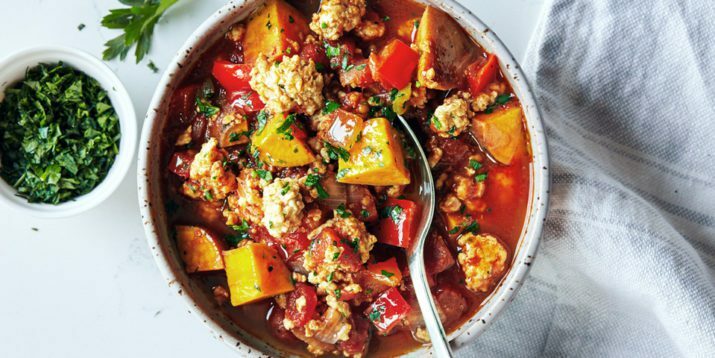 In addition to sweet potatoes, there are a number of ways to mix up your chili routine. If you’re craving a different meat, you could substitute ground chicken breast or extra lean ground beef instead of turkey. Or, use this recipe as a template and swap a cup of your favorite beans for the sweet potatoes. Not a spicy food fan? 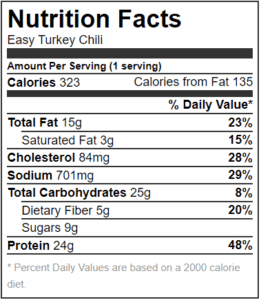 That’s okay, feel free to cut down (or omit) the chili powder. This easy turkey chili recipe maintains tons of flavor even without the heat. Want to crank up the heat? Add cayenne pepper to your heart’s content. 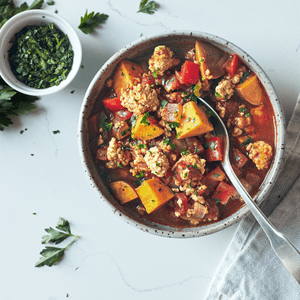 Or better yet, mix it up with this 21 Day Fix inspired Chipotle Pumpkin Turkey Chili recipe perfect for fall, and winter seasons. To add a bit of fun and creativity to this dinner, prep extra toppings for your family to add on top of their individual bowls. A sprinkling of grated cheddar or jack cheese, chopped green onions or cilantro, and plain Greek yogurt all make excellent garnishes. Add onion and bell pepper; cook, stirring frequently, for 4 to 5 minutes, or until onion is translucent. Add tomatoes, tomato sauce, sweet potatoes, water, chili powder, cumin, paprika, and salt. Bring to a boil. Reduce heat to medium-low; gently boil, stirring occasionally, for 20 to 25 minutes, or until sweet potatoes are tender. Evenly divide chili into four serving bowls; garnish with parsley, if desired.